Mouth brooding means that the fish keep the babies and/or eggs in their mouth until they are ready to swim on their own. The best example of this is the cardinalfish. 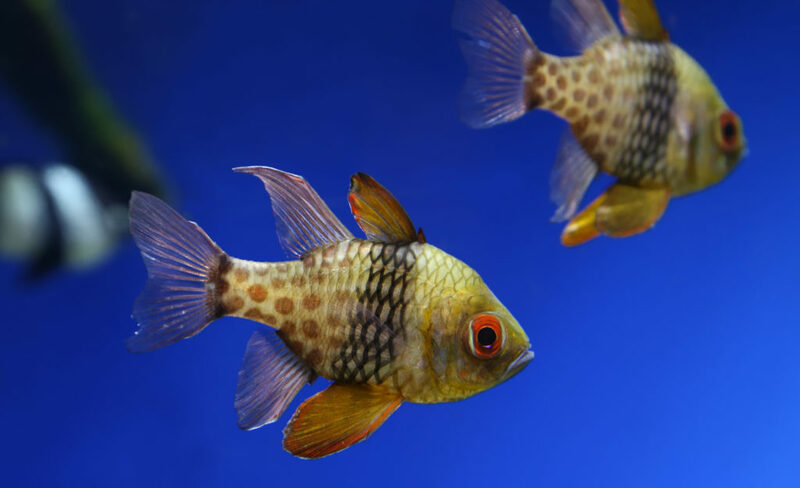 Cardinalfish, like the pajama cardinalfish above, actually have to live with at least one other cardinalfish or they are too lonely to go on by themselves! When the mother lays eggs, the father fertilizes them and then holds them in his mouth. He removes the bad eggs and turns the healthy ones until they hatch. Once hatched, they then live in his mouth for 10 days! When they are ready, they swim off on their own to be adopted by sea anemones who protect them until the cardinalfish are larger. The most protective parents are egg guarders. For egg guarders, it is usually the male that finds or builds the perfect nest to attract a female and then watches the developing eggs until they are ready to swim off on their own. Our aquarium has many examples of nest guarding animals, two of which live in the kelp forest – the kelp greenling and lingcod. In the fish world, it seems the fathers are more commonly the “stay at home” type. 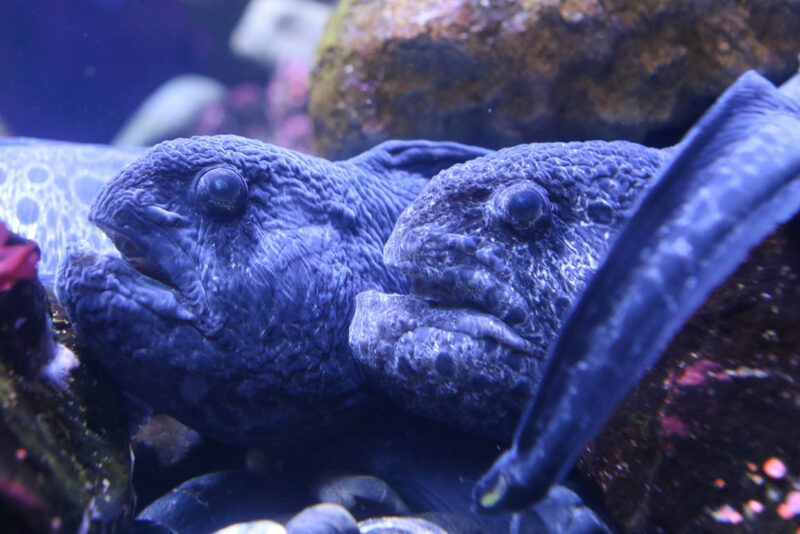 Wolf eels, pictured above, are one exception. The father and mother live together in a cave. When the time is right, the mother will lay eggs and the father will fertilize them. Both parents take turns holding and turning the eggs with their tail until they hatch. The female octopus dedicates her life to her children. Most species have a short lifespan. 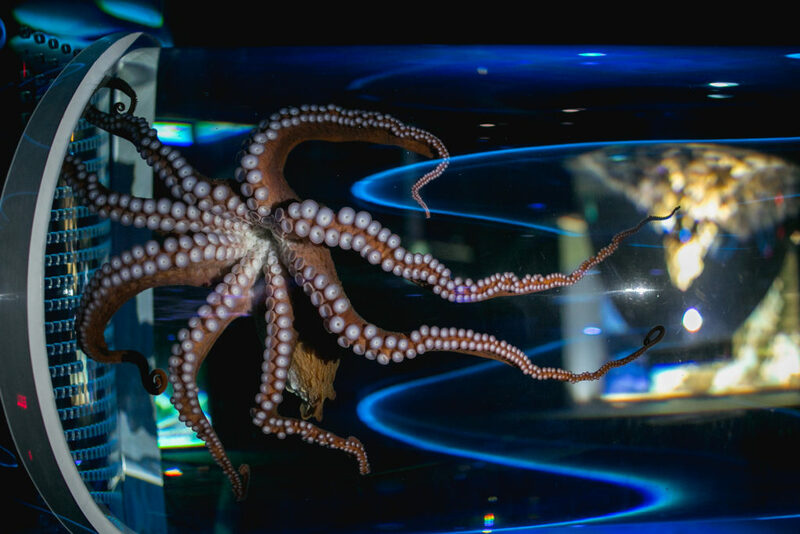 The giant Pacific octopus, for example, lives for a maximum of five years! An octopus usually grows really fast, reproduces and then passes away. The mating ritual between octopuses is pretty brutal, usually the father does not survive. The mother will lay thousands of eggs and gently brush them with her arms providing them with oxygen for their survival. During this time, the mother will usually fast. When the young octopuses are born, her final gift to them is her body as a food resource. Now the baby octopuses have their best foot forward for the new world. The oddest fish families are sharks! Here are a few amazing shark family facts. Hammerhead sharks spend most of their days alone searching for food. However, once a year they have a family reunion! Many hammerheads swim in from their solitary homes to meet their relatives. Their reunion is at a good feeding ground and a great place to meet their mate. These are one of the few schooling sharks, which is one of the theories behind their cephalofoil (hammer-shaped head). Some scientists think the extrasensory organs in their oddly shaped head aids in communicating with other hammerheads of the same species. At the Aquarium, you will find the smallest type of hammerhead, the bonnethead! If you are not a big fan of your siblings, then maybe you are a shark. Adelphophagy! No, that was not a typo. Have you ever heard of shark children fighting to the death in-utero? Well adelphophagy is the fancy science word for it. Usually this is a characteristic of larger sharks, such as the great white or shortfin mako shark. However, the sand tiger sharks at our aquarium reproduce the same way. You may think this strategy is odd, and why not have a sibling? They can sometimes be your best friend! Sharks want their children to have the very best chance of survival. If three sharks are born at once, usually only one of those three will survive to adulthood. There are predators that think small sharks are tasty. But, if a shark has three young and one consumes the other two, that one shark has a good chance of survival based on their initial size and full stomach at birth. Talk about sibling rivalry. Lastly, some female sharks can have children without a partner. They are not adopting their children; instead, they are making semi-copies of themselves. This process is called parthenogenesis. This is fairly rare and scientists only know this has happened because they have tested the genetics of the shark children. 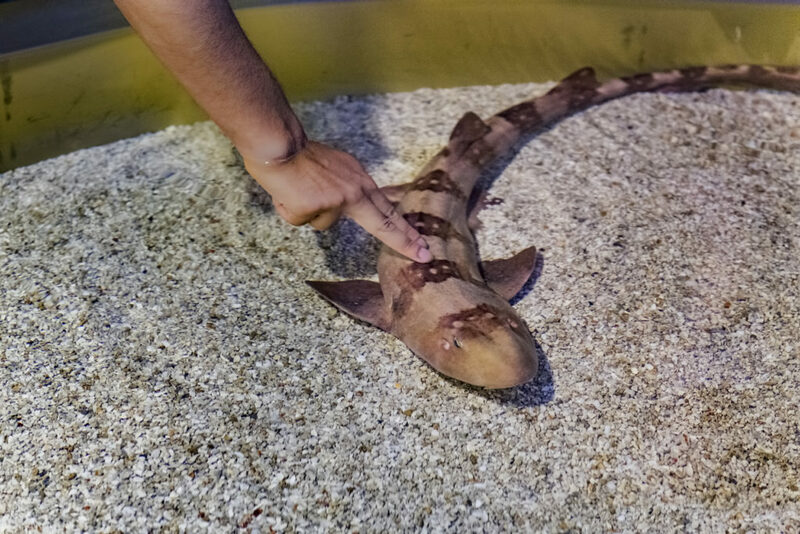 One of these parthenogenetic species lives at out aquarium, the whitespotted bamboo shark. If the sharks finds itself in an area without partners, female sharks will double the genetic material present in an existing egg, which can result in a child! You may think your family is quirky and odd, but you proudly celebrate them anyway. And here at the aquarium we celebrate all of our fin-tastic fish families! Happy Family Day! Danielle is a Lead Educator at Ripley’s Aquarium of Canada and the resident fish encyclopedia. Before the Aquarium, she received a Master’s degree from the University of Toronto in Ecology and Evolutionary Biology, focusing on lake trout otoliths. That led her to a research assistant position at The Ohio State University. After moving back to Toronto she wanted to inspire people of all ages to share in her appreciation of fish and other aquatic animals.